Our biggest party of the year is just around the corner! The Blue and Gold banquet is a special Cub Scouting tradition. 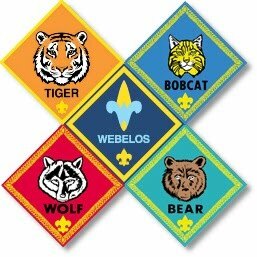 Most Packs across the country hold a banquet in February, which is the month in which the anniversary of Scouting takes place. It is a time for the Pack family to gather together and share food and fun, celebrating Scouting and all of the achievements the Scouts have accomplished this year. It is also when we present Rank badges earned by each of the Scouts. This year's celebration will take place on Saturday, February 21st, beginning at 5PM. The location is the First Presbyterian Church, 901 NE J Street in Bentonville. Our theme is "Mad Science". A pot-luck style dinner will be served, and we'll also have a themed dessert contest. Bring your favorite cakes, cookies, and other yummy treats that represent the theme! If you'd like to join us, please RSVP and sign up for your preferred side dish and/or dessert by clicking the link below. We look forward to sharing this special night with our Pack 121 family!